Good morning my lovely viewers! It’s about 11:00 am Italia time and I am sitting in Pasticceria Banchelli. Why you ask? Because the wifi at the Kehoe Center decided it wanted to stop working around 4:00 pm last night and we have had no luck rebooting it. Sigh. But I am currently taking advantage of the free wifi here and reminiscing on the dried fruit and nuts I had yesterday. Yes!!! Dried fruit and nuts. I nearly sobbed when I saw the stand at the Camucia market. Camucia is a small town located at the base of the mountain. It’s about a 30 minute semi vertical walk (seriously it’s like a 70 degree incline) down. The drawing professor gave her students the morning off to go explore the market, so I hopped on that bandwagon and began the shimmy down the mountains. 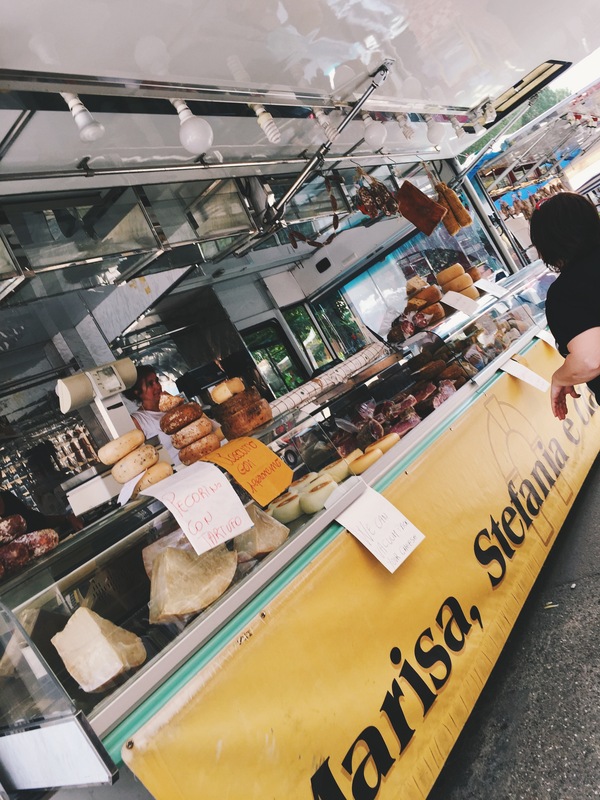 We had already experienced the Saturday morning Cortona market, so we assumed it would be the same. We were wrong and we were not disappointed. The Camucia Market was “bigger and badder” according to Adele, with stands of linens, tapestries, and scarves floating in the breeze. Shoe vendors, dress makers, and artisans yelled out to us as we browsed their selections. “Ciao belle ragazze” the men would shout. The vendors lined the towns street, splitting off into avenues of fruit stands, clothing, and meat trucks. Samples of fresh Parmesan, pecorino, and Bufula Mozzarella gave off a faint aroma and tempted me with every breath of air. The vendors had no problem donning out free samples to persuade you to buy their products. 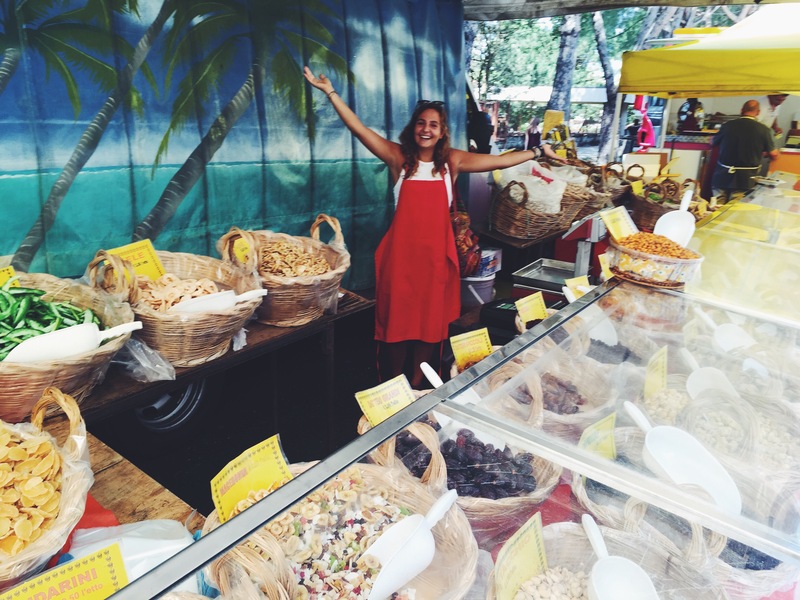 After a little more wandering and a lot more sampling, we stumbled upon a dried fruit stand. I think the heavens opened up and Angels sang. Melon, pineapple, kiwi, bananas, walnuts, almonds, everything under the Tuscan sun!! I attempted to strike up conversation with the owner and he explained to me it was all natural with no added suger or preservatives. Fun fact, a very large majority of the preservatives and additives we put in our food in America are illegal in Italy. We chatted for a little longer and I filled a bag with un po di tutto (I’m ashamed to say I’ve already eaten it all). It was almost lunch time, so true to our fashion, we tried to find a place where all the locals go. And again, true to our fashion, we found ourselves in a hole-in-the-wall café tucked behind some shops. It was probably one of the best lunch buffets I have ever had, and one of the cheapest! 7 euros gained me access to fresh, homemade pastas, chicken salad (I asked him if there was mayo in it and he looked at me like I was insane. Mayo? What’s that?? ), vegetables, fruit, and the best mozzarella I’ve had since I’ve been here. It was definitely my favorite lunch I’ve had since I’ve been here. Not going to lie, I’ve been getting a bit tired of pizza and pasta for every meal. Kinda. Not really. In order to skip working out yesterday, we decided to walk back up to Cortona instead of taking the bus. Walk is an understatement. If you’ve ever hiked Tallulah Gorge, you know how steep the Sliding Rock Path is. It’s like that minus the rocks you can use to pull yourself up. Combine that with the hottest day we’ve had since our arrival and you get a very sweaty madbro. But good spirits and dried fruit kept us going and about 50 minutes later we found ourselves praising the heavens that we made it back to the Kehoe Center….even if it was sans wifi.